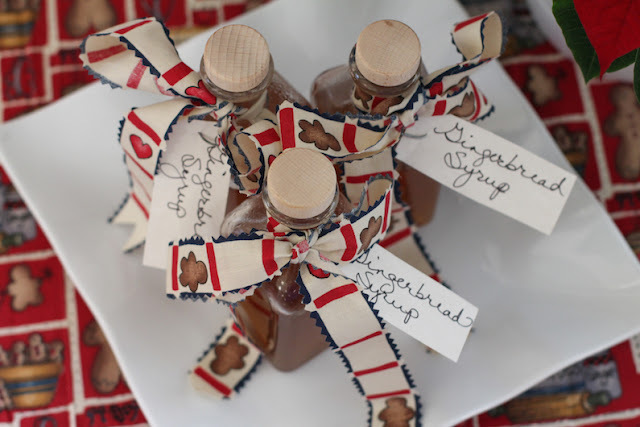 Warm gingerbread syrup is spicy and sweet, made with both fresh and powdered ginger. 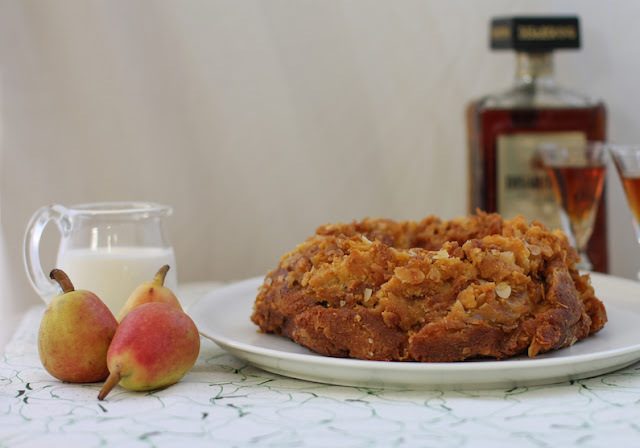 Put a little zip in your drinks and desserts this holiday season. 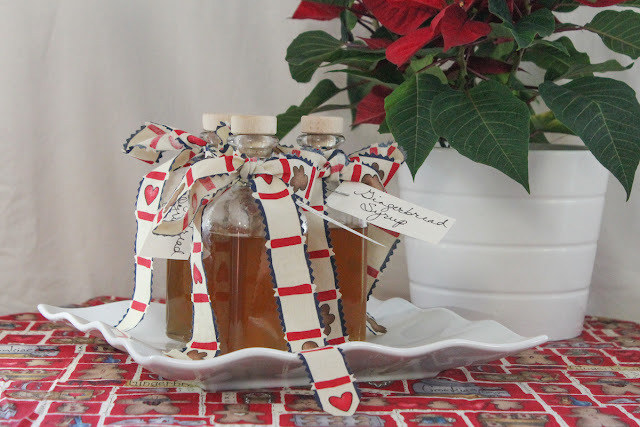 Here the warm refers to the spiciness that the fresh and ground ginger add to this gingerbread syrup, although you can certainly warm it to serve as well. 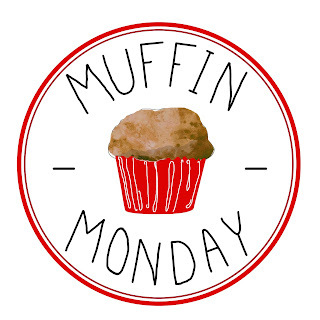 Pour it over ice cream, drizzle it on a Victoria sponge cake, add some to your hot cocoa, tea or warm apple juice. 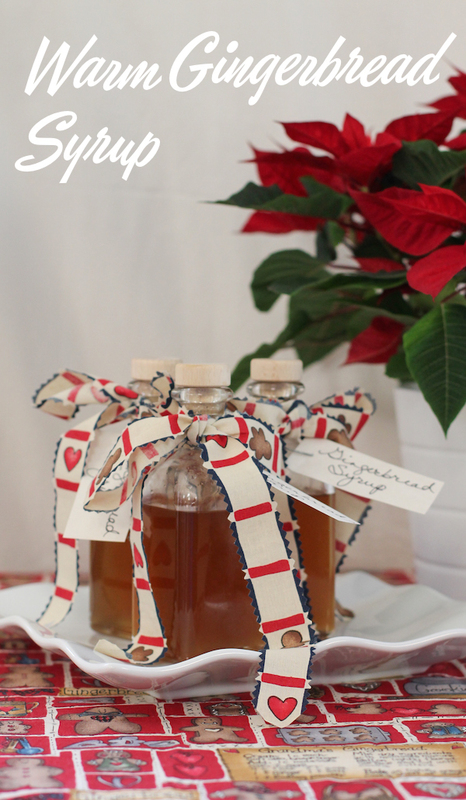 A tablespoon or two of gingerbread syrup is also delightful poured in a Champagne flute and topped up with bubbly. As a person who makes jams and chutneys and syrups, I know the work that goes into them. That’s why I am always grateful to receive a homemade food gift. Heck, who am I kidding? I am always happy to receive a food gift if it is special, even if it’s store bought. This week my Sunday Supper group is sharing recipes for homemade food gifts. I’ve got to tell you that I am thrilled with how this warm gingerbread syrup turned out and I am having a hard time parting with it. We love spicy food at our house but I tend to think of chilies bringing the heat. I forget how spicy and warming ginger can be! This stuff would be wonderful simply added to some hot water on a chilly night. It’ll warm you up from the inside. Note: Golden caster sugar is fine, free flowing dry sugar that is unrefined so it adds color and a bit of a buttery flavor to this syrup. If you can’t find it where you live, you can use regular fine white sugar but replace a tablespoon or two with brown sugar to get the same effect. This is the brand I used, available on Amazon. Unfortunately, the shipping makes it a pretty expensive option though. 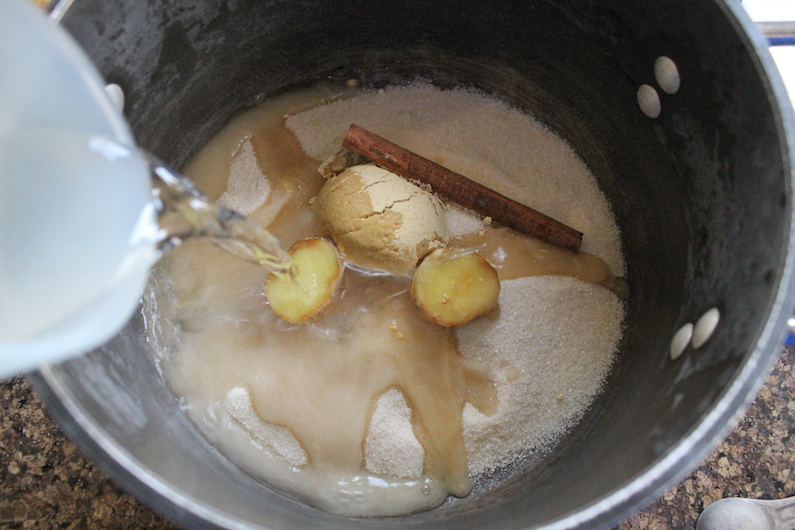 Put the sugar, ground ginger and fresh ginger into a pot with the cinnamon stick. Pour in 1 2/3 cups or 385ml water. Bring to a low boil. Stir occasionally to help the sugar dissolve. Boil gently for about 8-10 minutes or until the syrup has reduce a little. Strain the syrup through some cheesecloth set in a fine strainer over quart- or liter-sized measuring cup. The above ingredients yielded 2 1/2 cups or 600ml of warm gingerbread syrup. Pour into sterilized bottles and decorate with fabric or ribbons. If you are looking for some homemade food gift recipes to make for your loved ones this year, Sunday Supper has got you covered. Check out this major list of options. Many thanks to our host this week, Christie of A Kitchen Hoor's Adventures and our event manager Cricket from Cricket's Confections. 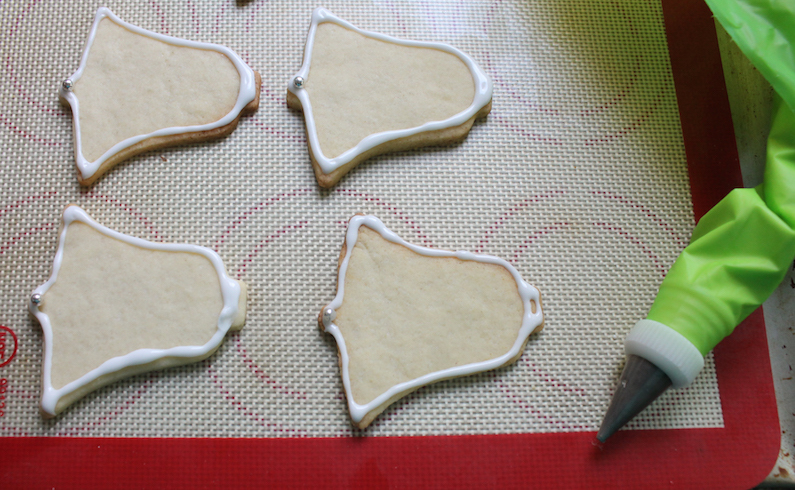 A great sugar cookie recipe that actually keeps its shape when baked. 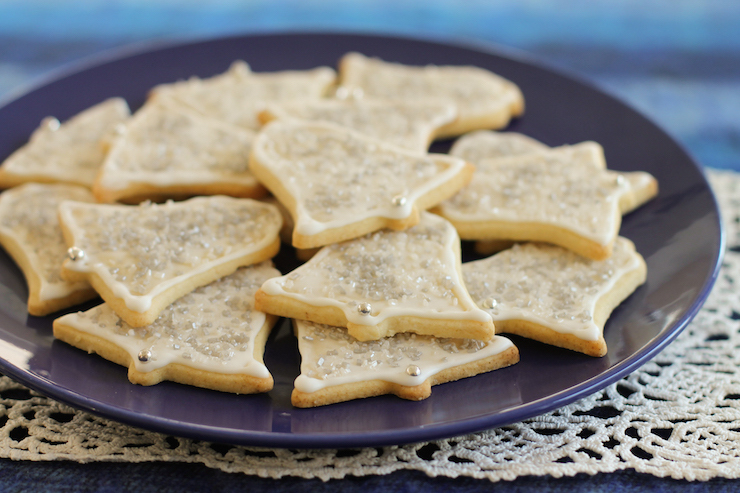 Mix up your sparkling sugar decorations using both crystal white and silver to make your silver bell sugar cookies really shine. And don't forget the silver dragées for the clappers. If you look back through my recipe archives, there is not a single cookie that’s been rolled and cut out with a cookie cutter to be baked and decorated. Not one. And in last five and half years I have shared 53 cookie recipes. I just counted. 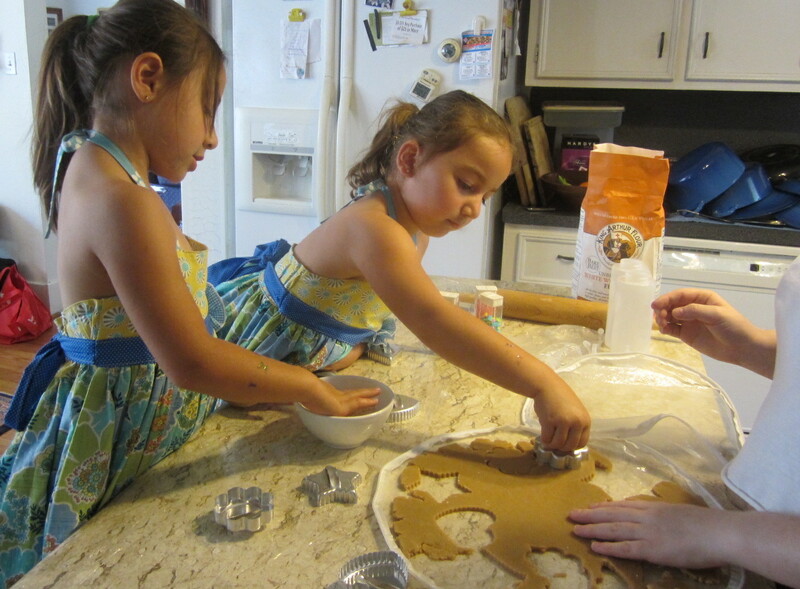 When my girls lived at home, baking sugar cookies was a fun activity year-round but we really got into them – and making gingerbread men to decorate - just before Christmas. 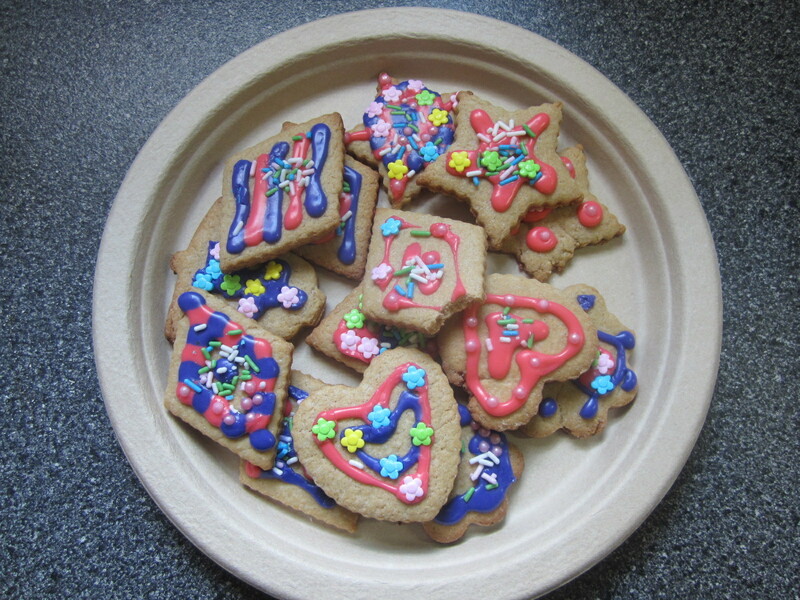 A couple of summers ago, I invited my small nieces over for a sugar cookie baking/decorating session where as many sprinkles were consumed directly as were put on cookies. But we had a lot of fun! And since they didn't care about anyone else's idea of perfection, their cookies were fabulous and creative and beautiful. Tip: For children (or adults who need more encouragement), fill squeezy bottles with the royal icing. They are much easier to handle than piping bags. I’ve finally figured out that what I mind about making these things is not the time or the patience they require but the lack of company in my kitchen. So here’s my recommendation to you. Put on the holiday tunes. Mix up a batch (or two) and invite some friends or family over to decorate with you. 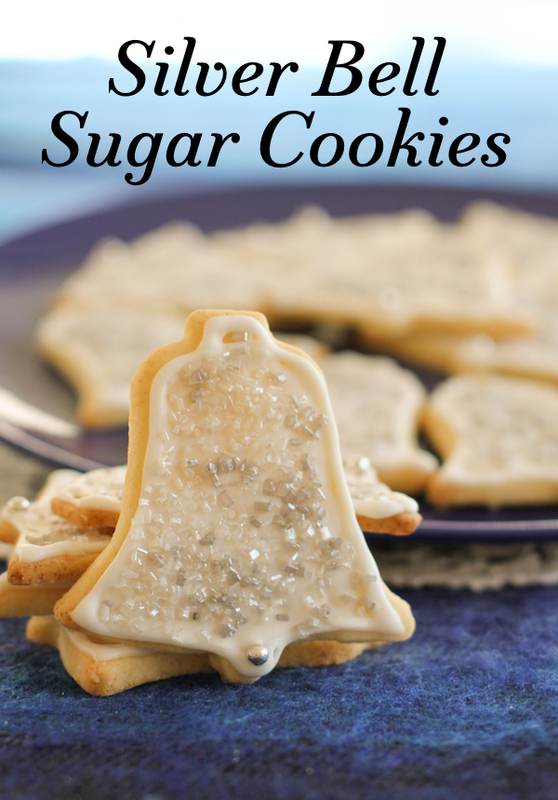 Of course, you don’t have to make silver bell sugar cookies. Use your own favorite cookie cutters and colored sprinkles. And while this is a great time of the year to get together, sugar cookie baking sessions can be fun all year round. Important: Uncooked egg whites should not be served to anyone with a compromised immune system, unless those whites are from pasteurized eggs. Substitute an equivalent combination of powdered egg whites and water, according to the package instructions. In a large mixing bowl or the bowl of your stand mixer, soften the butter by beating it for a minute or so. 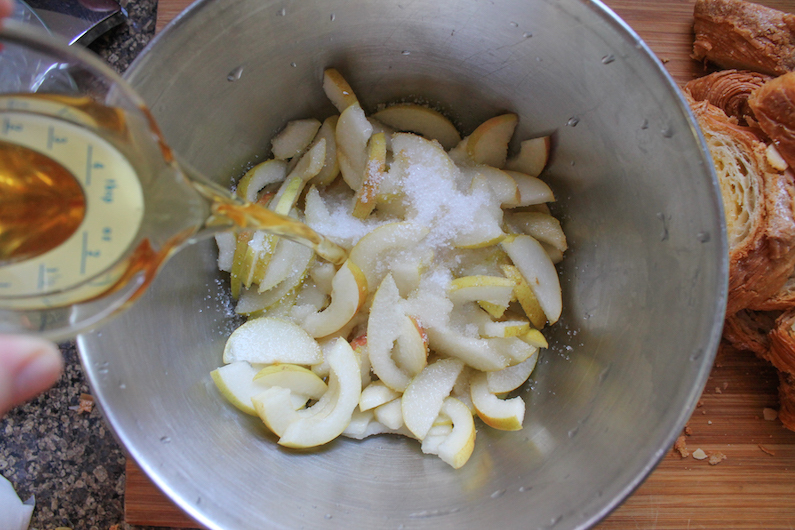 Add in the sugar and beat until light and fluffy, scraping down the bowl occasionally, as needed. 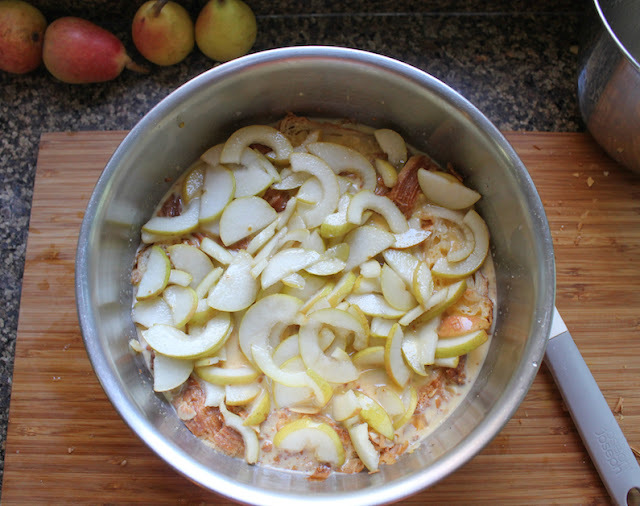 Add in the egg white and vanilla and beat again until they are fully incorporated. 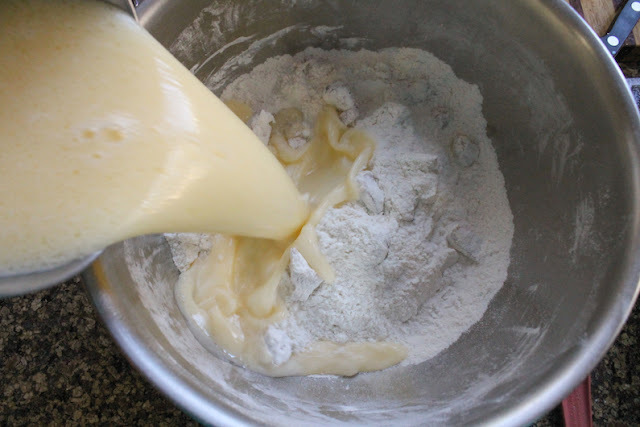 Add in the flour a bit at a time until it is completely mixed in and you have a soft dough that is firm enough to roll out. Divide the dough into two pieces and roll them each out on parchment paper until they are about 1/4 in or 1/2 cm thick. 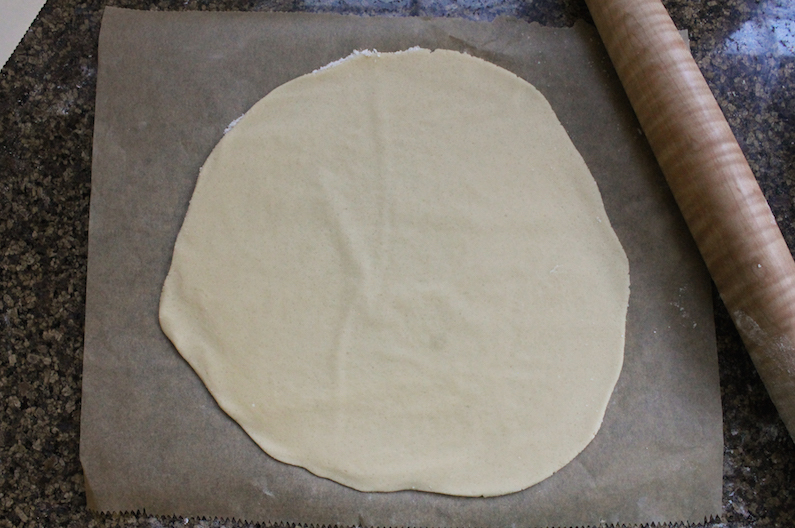 Sprinkle on a tiny bit more flour if you must to keep the dough from sticking to your rolling pin. Cover with cling film and refrigerate for at least one hour or until ready to bake. Line your baking sheets with more parchment or silicon liners. If they are well chilled you can put these cookies fairly close together as they should not spread or puff very much. Well-chilled is key. 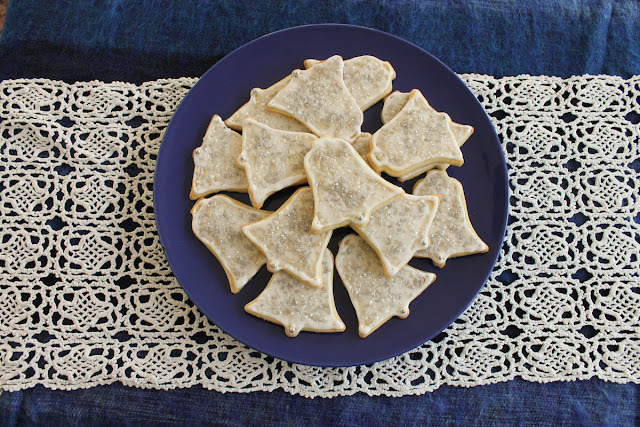 Remove one rolled dough circle from the refrigerator and cut out your cookies with a cookie cutter. Use a flat spatula to transfer them quickly to the prepared cookie sheet. 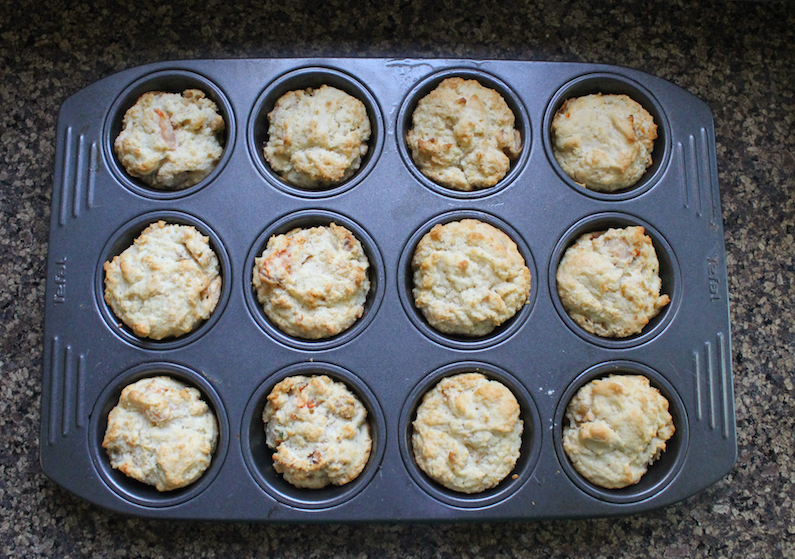 Bake in the preheated oven for about 8-10 minutes or until the edges are just beginning to brown. Remove and leave to cool completely before decorating. 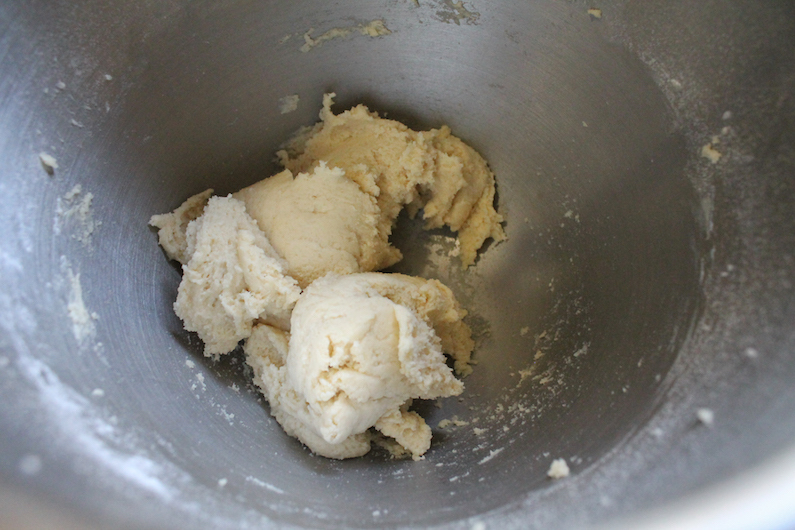 Continue the process until all the dough has been cut out and baked. NOTE: Always add newly cut cookies to a cool lined cookie sheet before baking. 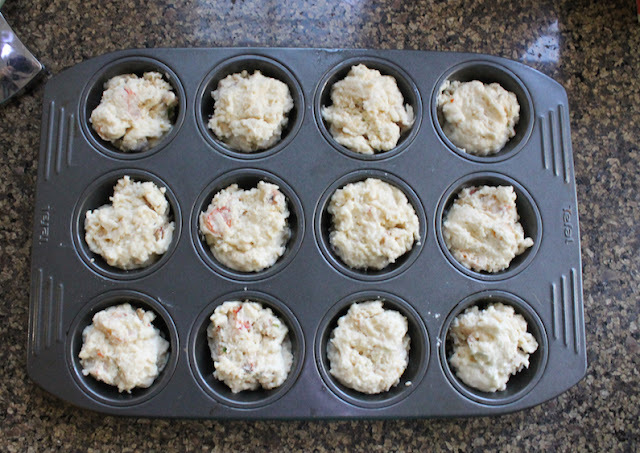 Putting them on a hot pan will cause the butter to melt out prematurely. 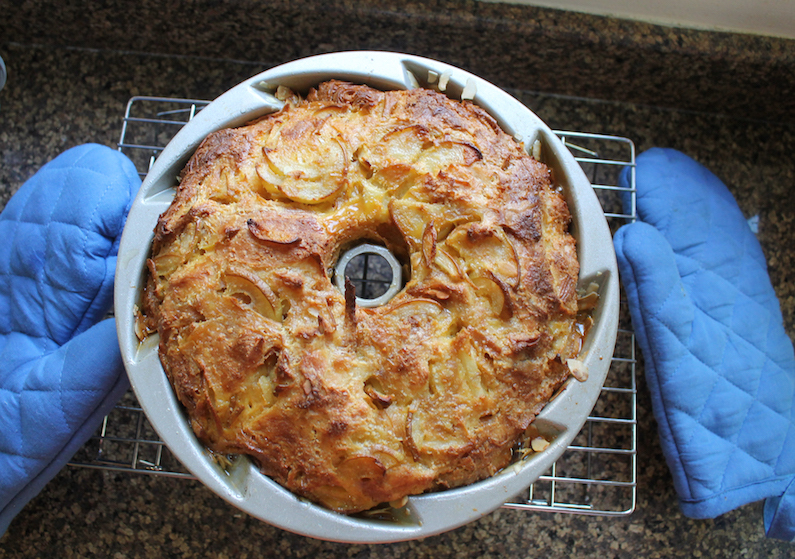 Having two or three pans to rotate is helpful. Once the cookies are completely cooled, make the royal icing. 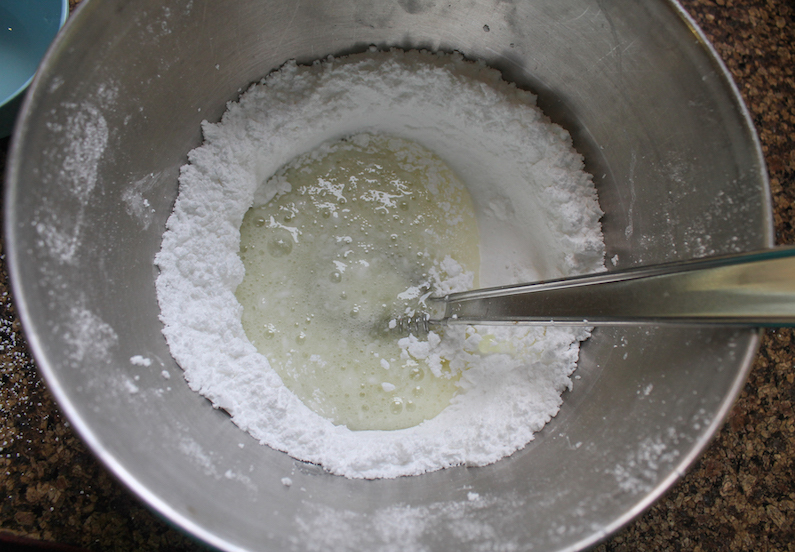 Sift the powdered sugar, cream of tartar and pinch of salt into a mixing bowl. 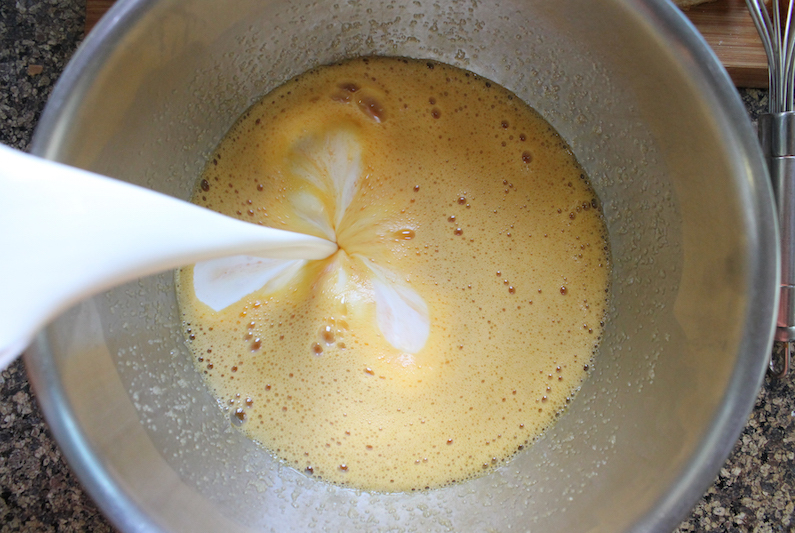 Add in the egg white (see important note above) and whisk it in a little at a time from the middle, until all is incorporated. Partially mixed in. Just keep whisking from the sides until all is incorporated. 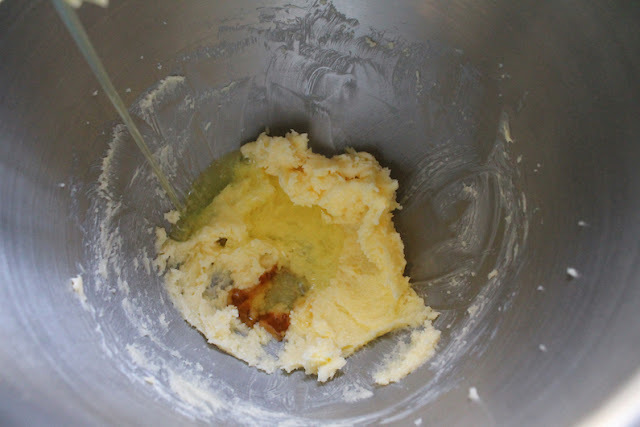 Check the consistency of the icing by lifting your whisk and allowing it to drip back into the bowl. Too runny? Add more powdered sugar. Too firm? Add a drop or two of water. You want to be able to pipe it but have it keep its shape. Spoon some of the icing into your piping bag fitted with a #3 tip. Pipe a royal icing outline of the cookie and pop on a silver dragée for the clapper, if using. 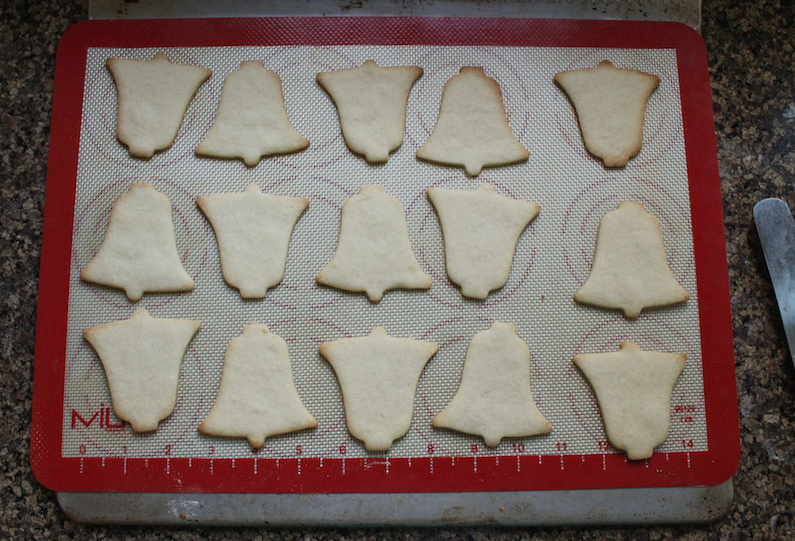 Outline all of the cookies and leave the royal icing to harden before you move on to the next step. Cover the royal icing bowl with a piece of damp paper towel, then cling film and refrigerate. When the outlines are hard, remove the royal icing from the refrigerator so it can warm up a bit, and stir to loosen up. Set up your decorating station putting one small saucer for each color of sprinkle or decoration you are using. This will allow you to reunite the sprinkles that fall off with their similarly colored brethren when all this is over. 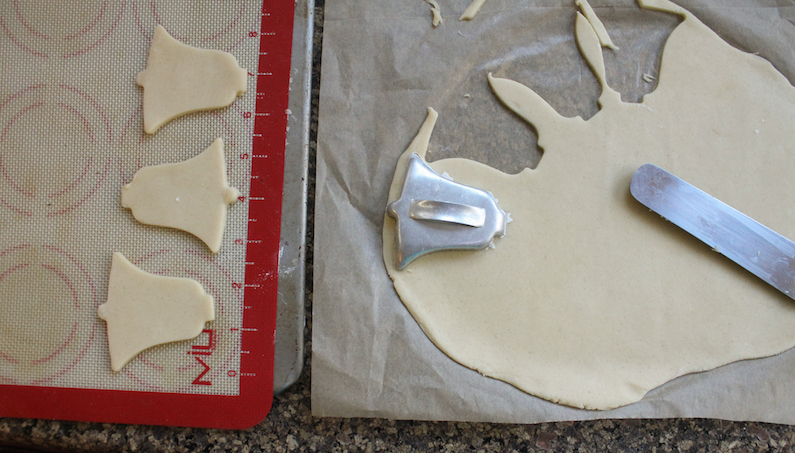 Put the cookie in the first saucer and use a spoon to add a puddle of royal icing into the middle of the cookie. 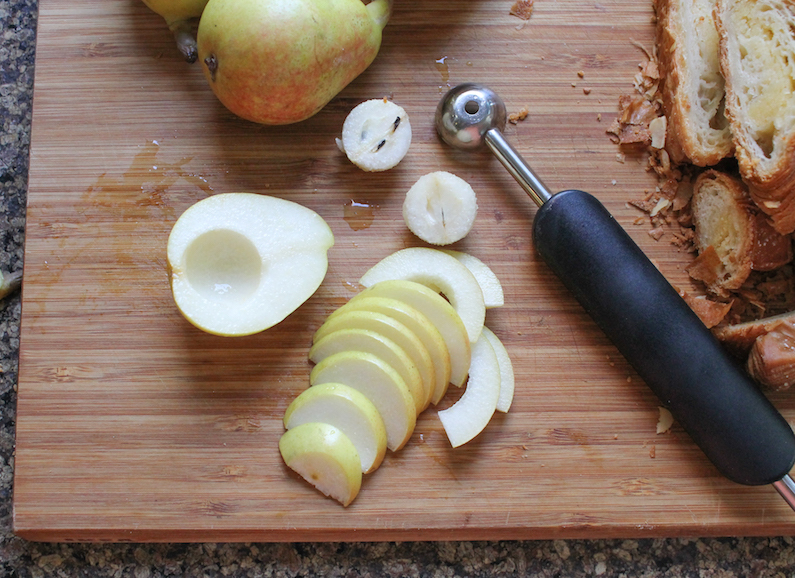 Spread it around right up to the hard outlines with a toothpick or even a clean paintbrush. Add some sprinkles. Shake the cookie so loose sprinkles fall back in the saucer. Move the cookie to the second saucer and add the next color sprinkles. Shake the cookie so loose sprinkles fall back in that saucer. Place finished cookies in a safe place where they can dry until completely hardened before trying to stack, package or transport them. This month my Creative Cookie Exchange group is sharing decorated cookies, perfect for the holidays or whatever you feel like celebrating! 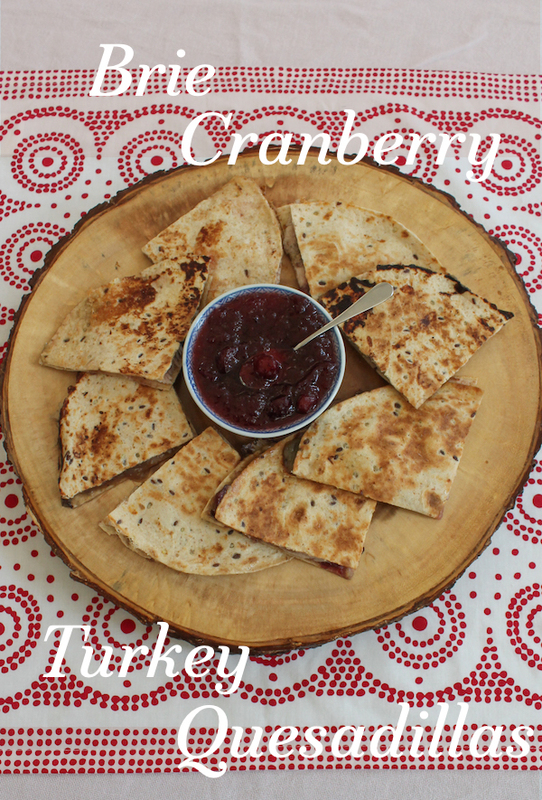 Brie Cranberry Turkey Quesadillas use up the leftover bits of your cheese board, a little of that cranberry sauce and some sliced up turkey to create a whole new dish for the days after Thanksgiving or Christmas. For many years my in-laws hosted a New Year’s Day recovery open house where they served vast pots of turkey soup made from the donated carcasses of all of their friends’ Christmas turkeys. Isn’t that a brilliant idea? All afternoon their friends would come by for some restorative soup and a drink or two to welcome in the New Year. 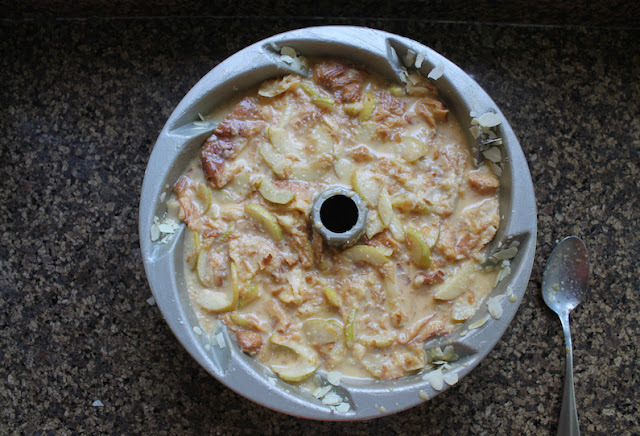 My go-to recipe for Thanksgiving and Christmas leftovers is turkey potpie. 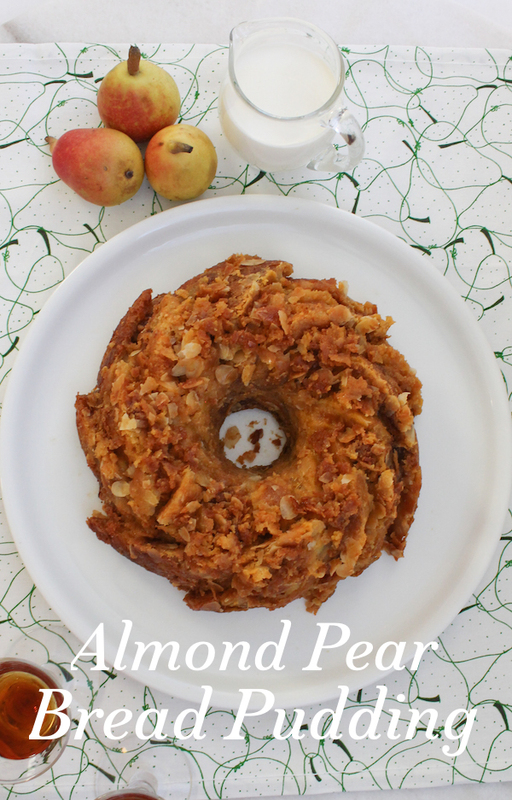 I make the filling every year from scratch, the recipe always in flux depending on the leftovers. I finally got around to trying to quantify the amounts when a reader requested it a few years back. Check it out here. 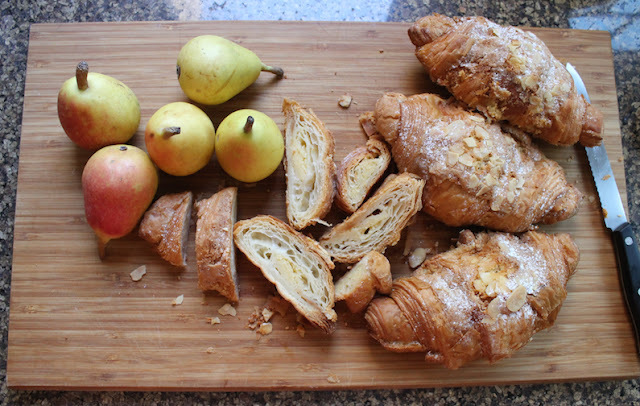 The filling is super easy and I top it with store-bought puff pastry, which makes the whole thing a doddle, as my British friends would say. This year I wanted to try something a little bit different and decided on quesadillas which incorporate the typical leftovers from my cheeseboard as well. 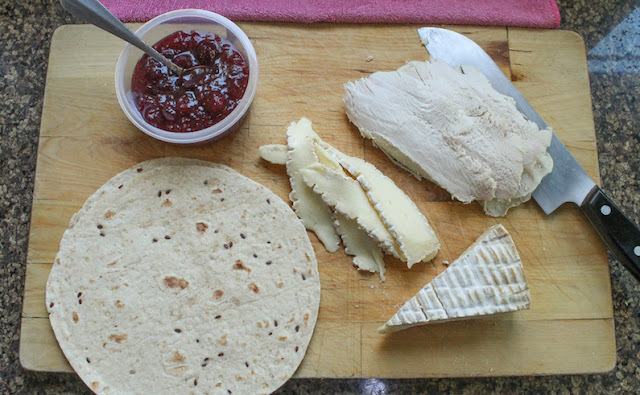 There always seems to be a wedge of Brie, but you can surely use whatever cheese you've got. I can’t give exact amounts since you’ll make as many as your leftovers will allow but I’ll try to approximate how much I used for each quesadilla. 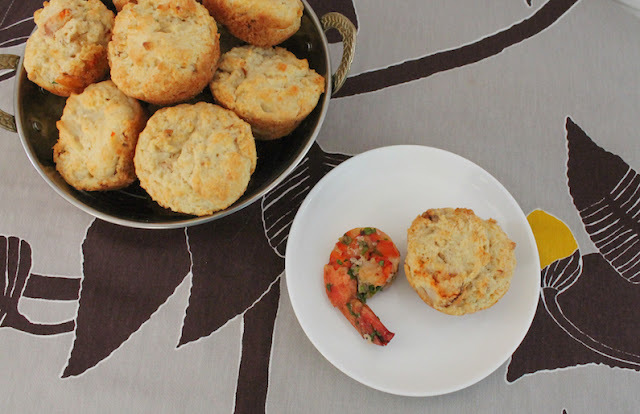 If you struggle with the leftover blues, make sure to scroll down to see all the great ideas my Sunday Supper friends are sharing this week. 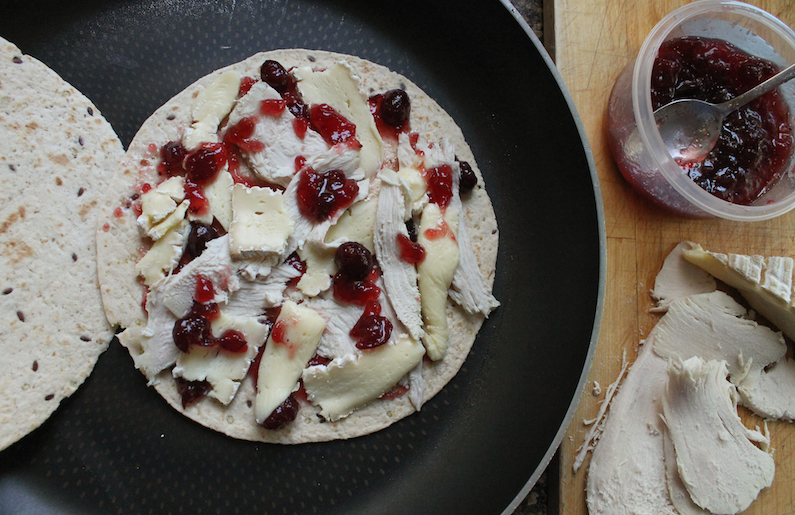 Put 2-3 teaspoons of cranberry sauce dotted around on one tortilla. Break the Brie and turkey slices into smaller pieces and arrange them on top of the cranberry sauce. Finish with a few more spoons of cranberry sauce. Put the other tortilla on top and press down lightly to stick it all together. 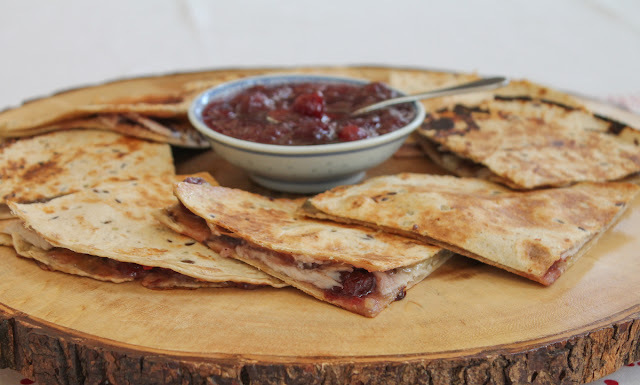 Warm the quesadilla on a griddle or a non-stick pan for a few minutes over a medium heat, waiting to turn it to the other side when the Brie has melted a bit and can act as a “glue” to hold the tortillas together. Carefully turn the quesadilla over and brown on the other side, cooking for just a minute or two more, until the filling is warmed through. 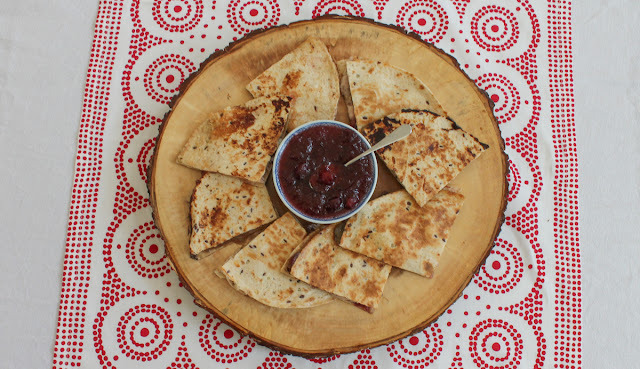 Remove from the griddle and leave to cool for a few minutes before cutting the quesadillas into quarters (or smaller) with a sharp knife or pizza wheel. Serve with extra cranberry sauce if you have enough left over. 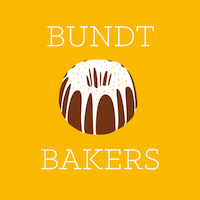 Many thanks to this week's host, Christie of A Kitchen Hoor's Adventures and our event manager, Cricket of Cricket's Confections. 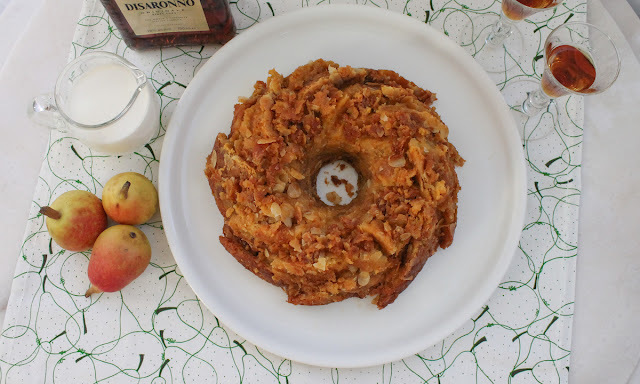 We've got nearly 30 outstanding ideas for transforming your holiday leftovers. 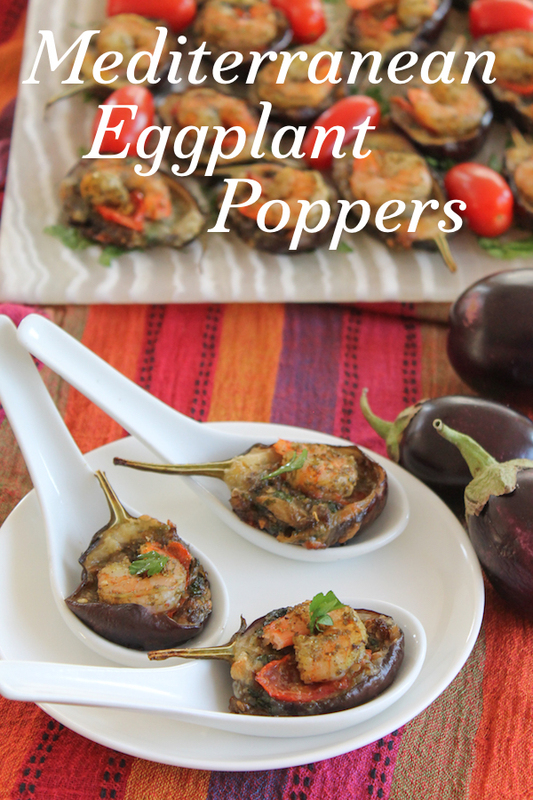 Mediterranean eggplant poppers combine the lovely flavors of za’atar, roasted eggplant, mozzarella and tomatoes for a great appetizer your guests will love. They are even more special topped with shrimp. When I have the time, I like to head to the big hypermarket not too far from my house and wander around the fresh produce section looking for inspiration. They carry an amazing selection of fruit and vegetables from near and far, all shiny, bright, colorful and clearly full of nutrition and vitamins. Just a couple of days ago, I came across the loveliest little eggplants there. I shifted through them looking for the smallest ones, trying to select ones of similar size, with good stems still attached. Right there, in my head, I made up this recipe. 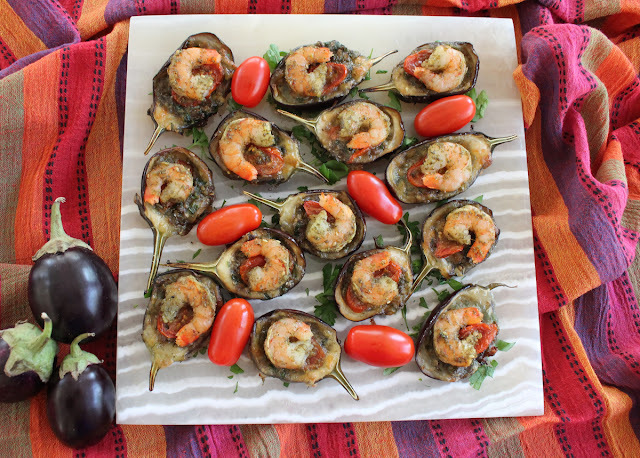 Like this: What goes with eggplant? 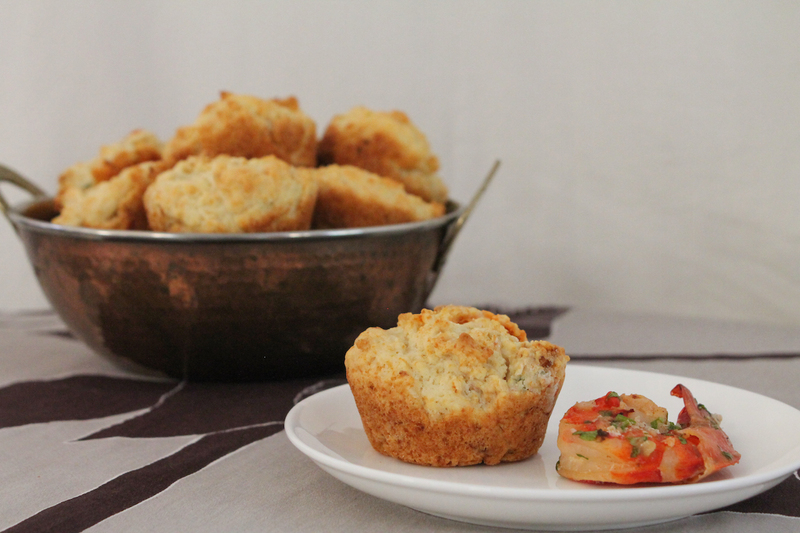 Garlic and tomatoes. What goes with garlic and tomatoes? Mozzarella, of course. 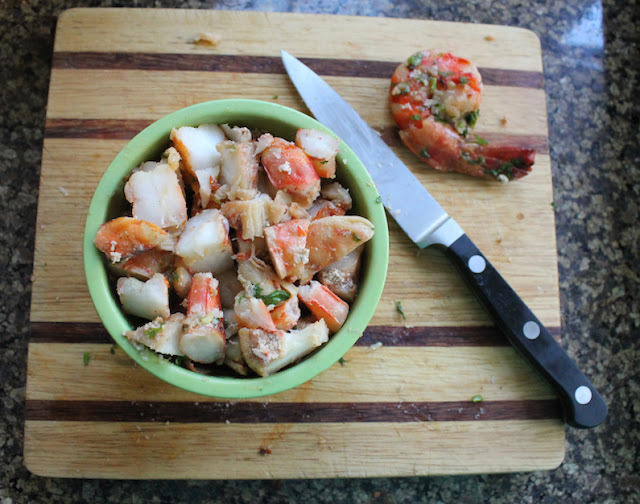 And because today I am joining the Fish Friday Foodies in sharing appetizers, I decided to top the whole lot with some seasoned shrimp. And that is the weird and wonderful way my brain works. Scrub the little eggplants clean then cut them in half, trying to split the stem as well. 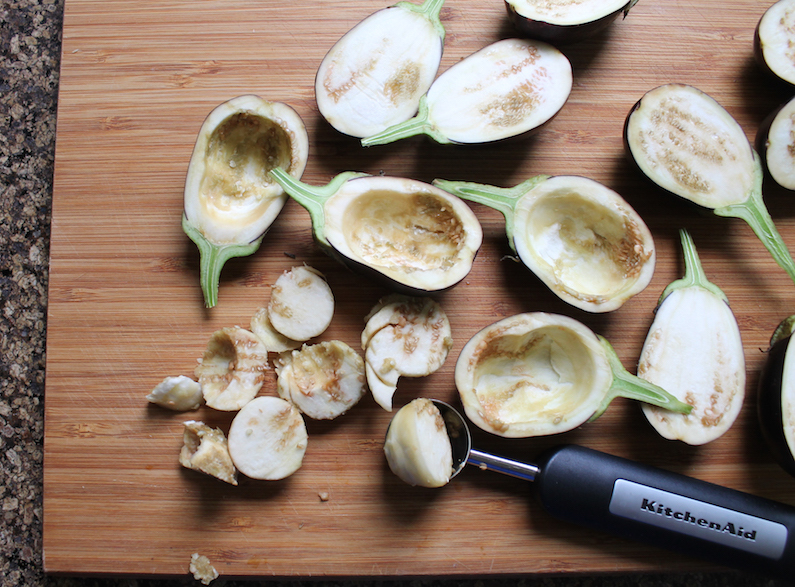 Scoop out the insides, chop and set aside. 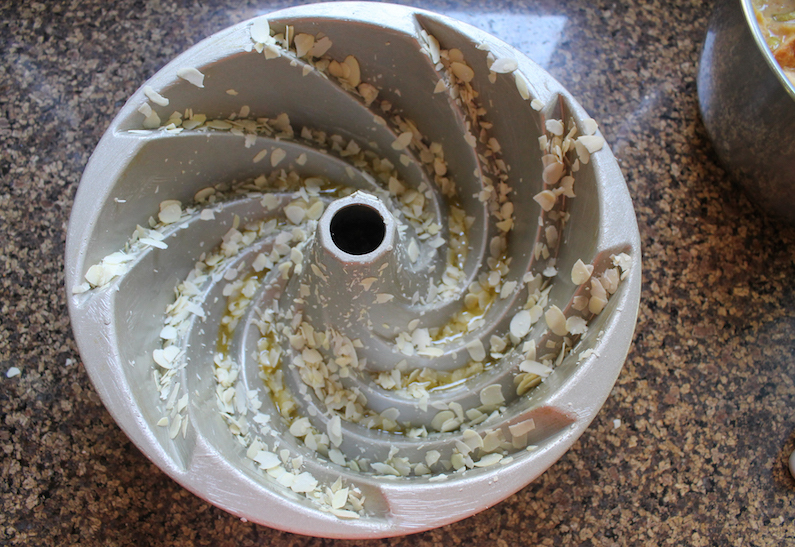 I use a melon baller for the scooping. Put them in a baking pan. Mince the garlic cloves and chop the parsley finely. Cook the eggplant insides in a small pan with a good drizzle olive oil, sprinkle of salt and pepper plus one teaspoon of the za’atar. When all of the water has cooked out of the eggplant and it’s browning, add in the garlic and cook for a couple more minutes. Tip in the parsley and cook for another 30 seconds or so, until the parsley wilts. 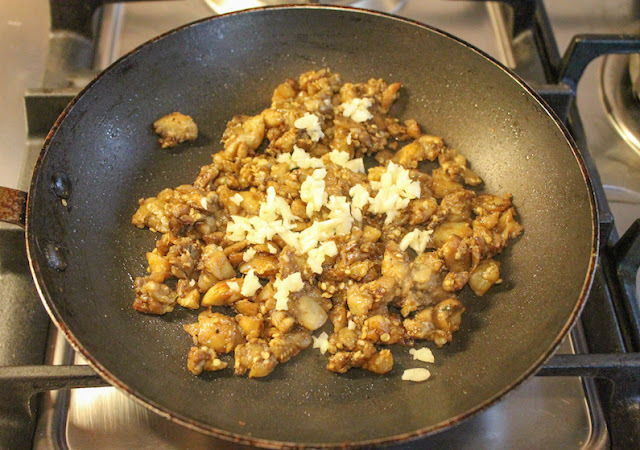 Taste the filling and add more salt, if necessary. Remove from the heat. Cut the mozzarella ball into thin circles. 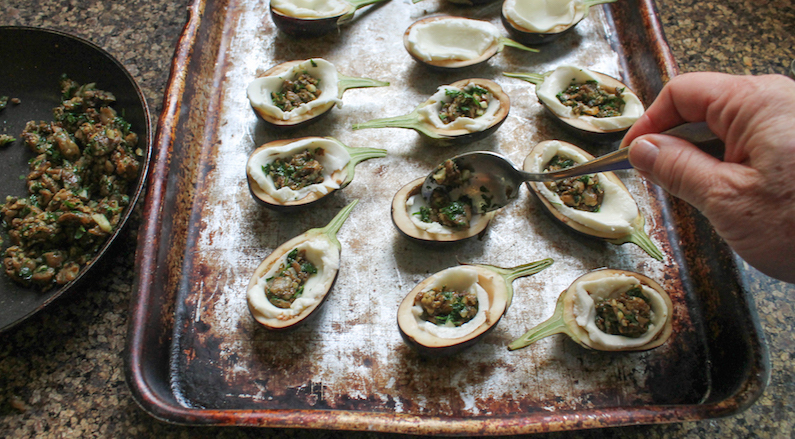 Fit them into the eggplant halves. 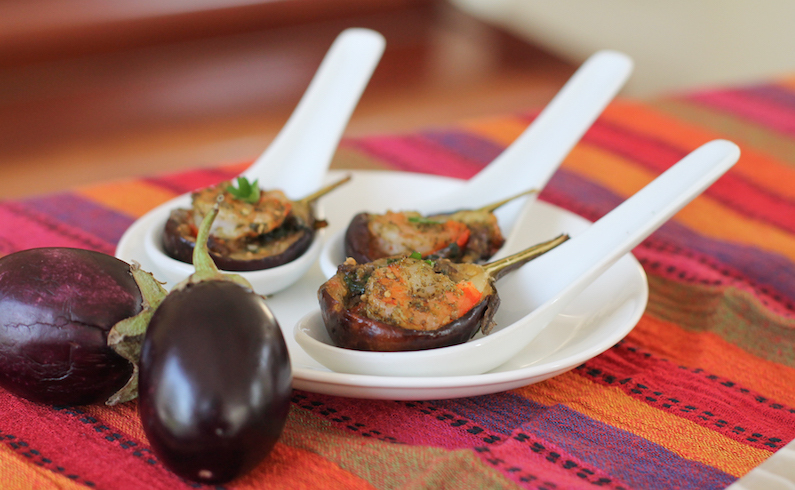 Add the filling, dividing it between the eggplants. Slice the grape tomatoes and put one slice on top of the filling. Drizzle on some olive oil. 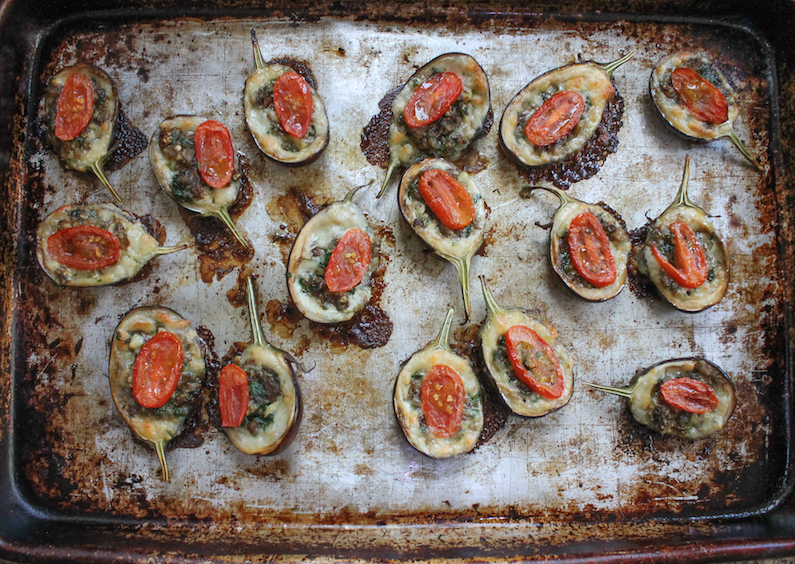 Roast in your preheated oven for about 15 minutes or until the eggplants start to slump a little and are browned around the edges. Some leakage happens but when you scrape those bits up with a metal spatula, you get to eat them. Score! Make sure you are in the kitchen alone when these come out of the oven and you won't even have to share that bonus. 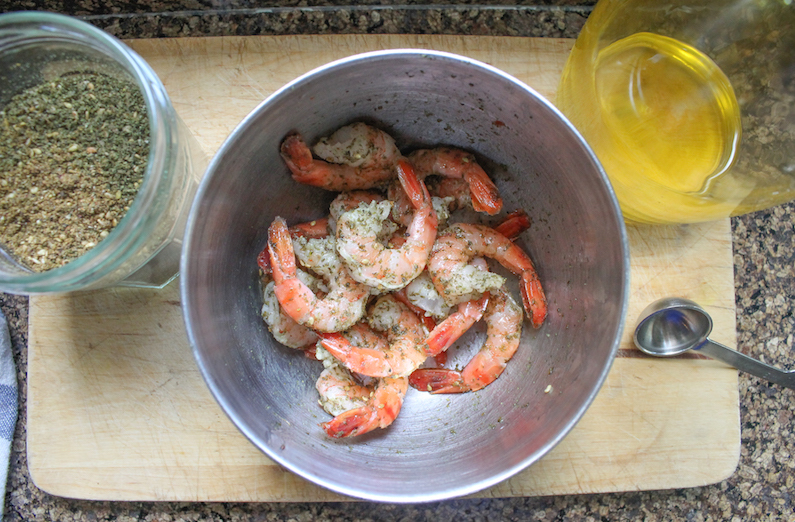 Meanwhile, dry your shrimp and put them in a small bowl. 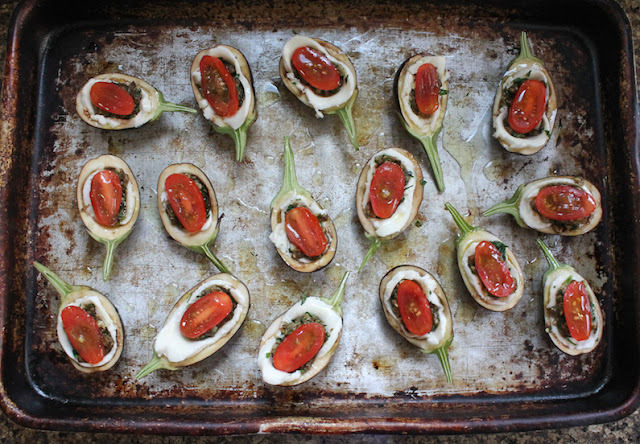 Drizzle them with a little olive oil and toss them around to coat. Add the last teaspoon of za’atar and toss again. Note: There are various za'atar recipes. I prefer what's known as Lebanese za'atar but you can use your favorite. Ignore the little tails on the shrimp. I did remove those before I put the shrimp on the eggplant poppers. 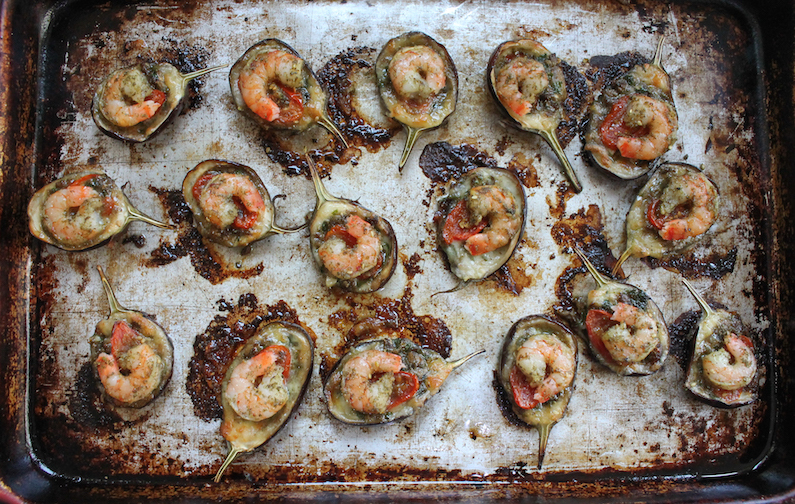 Remove the baking pan from the oven and top each eggplant with one shrimp. Pop the pan back in the oven for another five minutes to warm the shrimp through. 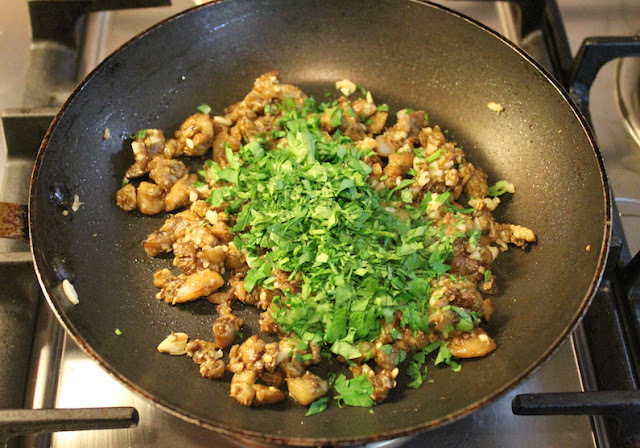 Serve warm, sprinkled with a little more chopped parsley, if desired. For a vegetarian option, skip the shrimp step. We love shrimp but these Mediterranean Eggplant Poppers are fabulous even without them. And they are just as pretty. Here they are pre-shrimp. Update: Just ate a leftover eggplant popper straight out of the refrigerator. They are even good cold. Many thanks to this month’s Fish Friday Foodie host, Wendy from A Day in the Life on the Farm. 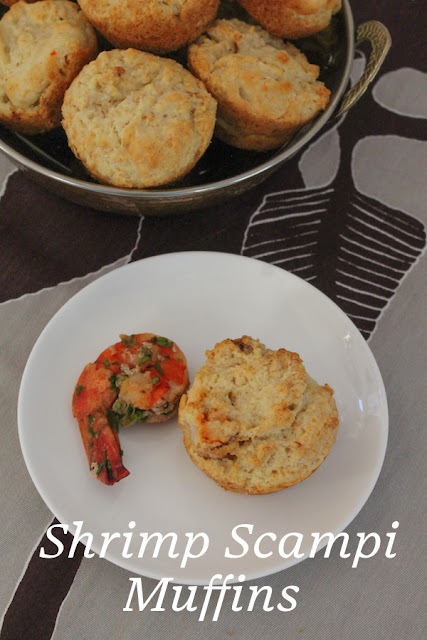 If you are looking for creative holiday appetizers or first courses with seafood, you’ve come to the right place!